Early in the summer of 2015 I embarked on another trip around Slovenia in the company of Ivana the Slovenia Explorer guide and a lovely English couple who had never been to Slovenia before. The fact that it was all new for them was part of the trip’s charm for me, as there is something exciting about seeing the country you live in through the fresh eyes of someone who’s never experienced it before. 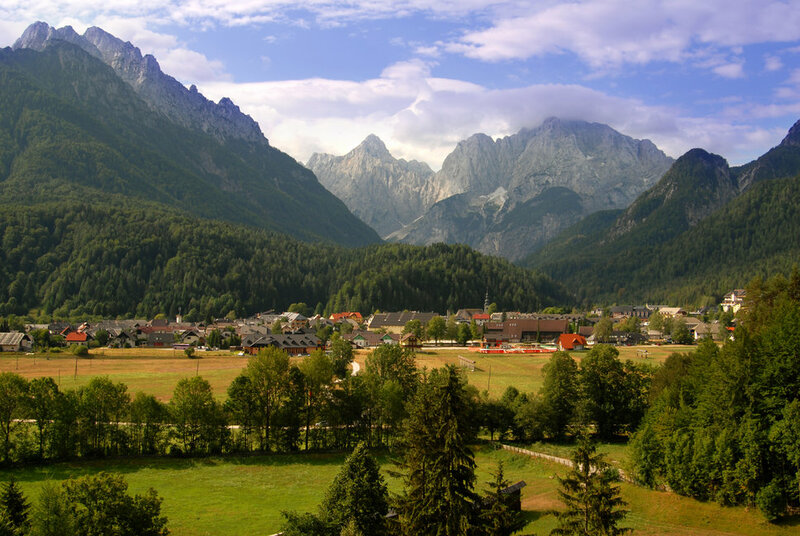 This time around, our goal was to visit the Posočje region, and our first stop was Kranjska Gora, a small town in the Julian Alps. 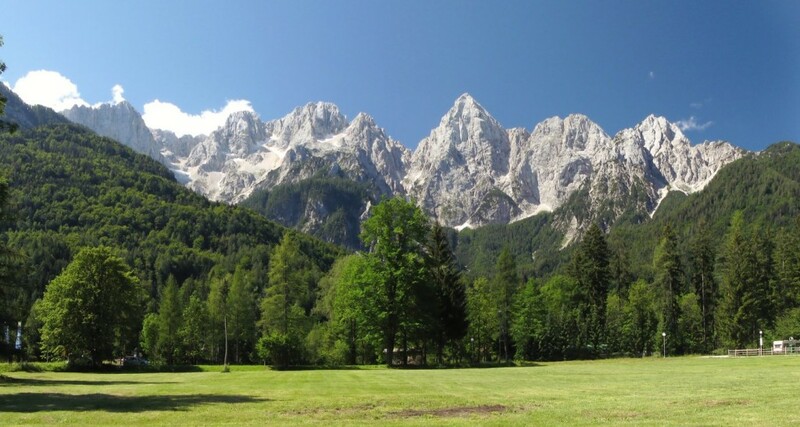 Naturally, due to its location, Kranjska Gora is most active in the winter, when various winter sports events take place, but even in the summer, it has its charms. Its appearance is the very definition of the word alpine, and its architecture and the mountainous backdrop are evocative of old European fairy tales. It would not be surprising to run into a Snow White somewhere in the street, and it would seem perfectly normal if the townspeople joined her in choreographed song and dance. We enjoyed a coffee and a brief walk through the old town centre in the early morning, but, as we were on a fairly tight schedule, we soon made our way onwards, towards our next goal, Vršič pass. 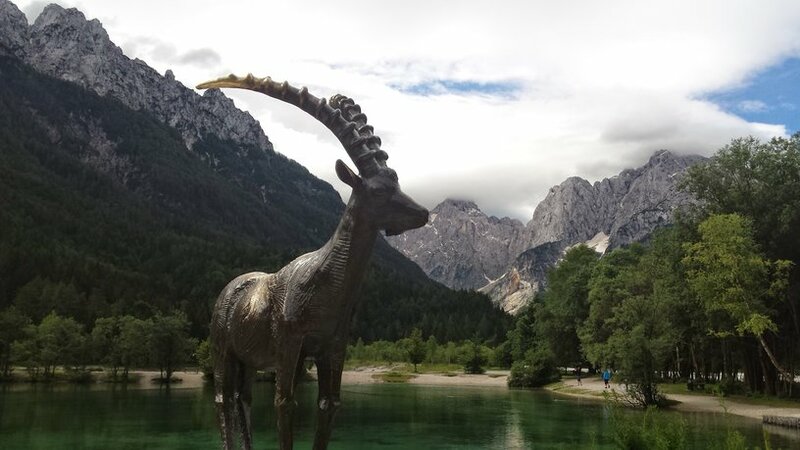 However, as Slovenia is a land of many small wonders, we were compelled to take a short break near the beautiful Lake Jasna and its ibex statue, where we wondered at the lake’s clear water and listened to Ivana tell the legend behind the bronze statue of Goldenhorn, or Zlatorog in Slovene. I don’t want to spoil the whole story, but it is a daring tale of adventure, romance, betrayal and magic, and listening to it while gazing at the larger than life mountains behind Lake Jasna is an experience one is not likely to soon forget. On the tail of that story, we made our way to Vršič pass, the highest pass in Slovenia at 1.611 metres. We drove up the long and windy Russian Road, so named after the Russian prisoners of war who had built and maintained it during World War I, and learned about the historical importance of both the road and Vršič pass itself. Many enthusiastic cyclists opt to cycle up this fairly steep road in the summer, and it is not unusual at all to see them riding upwards in full cycling gear. We eventually reached the Russian Chapel, a fairly surprising sight, what with it being a Russian Orthodox chapel dedicated to Saint Vladimir, but it becomes less so when one is acquainted with the story behind it. It was, in fact, erected by those same Russian POWs, as a memorial to their fellow prisoners, who had died while building the road. 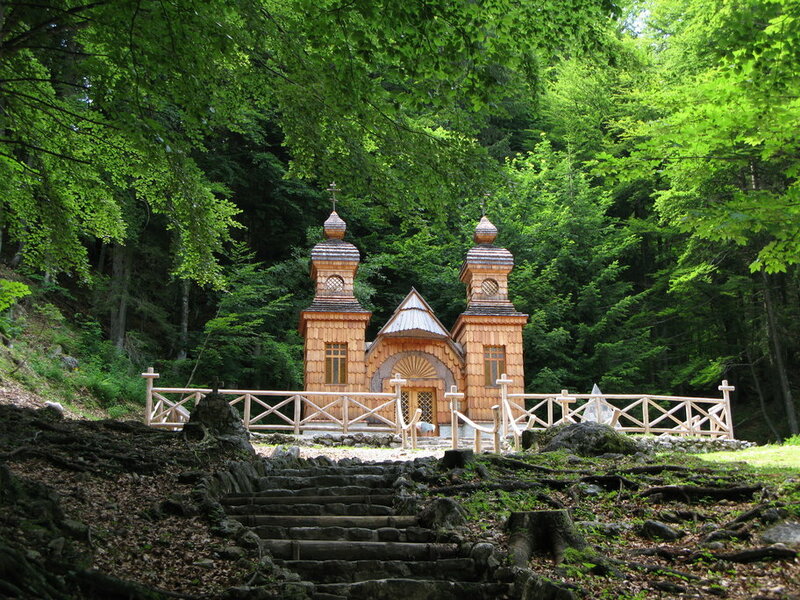 It is a beautiful little chapel, situated in a very quiet, lonely place, surrounded by nature, a lone refuge of peace and solemnity in the midst of wilderness. 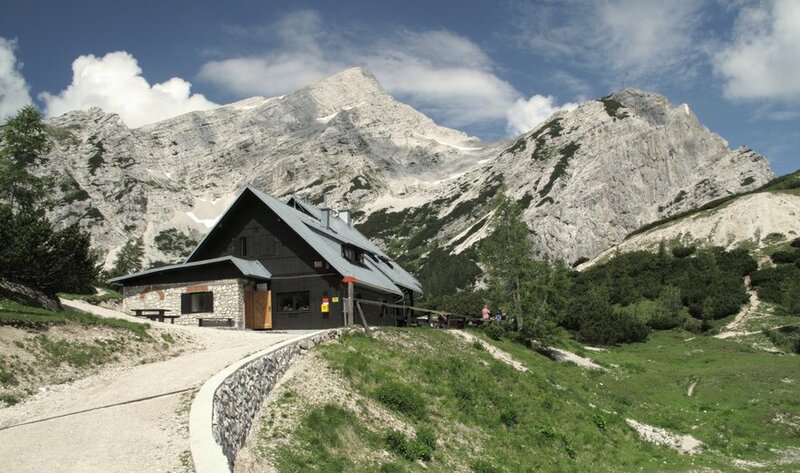 There are about a million places to stop and take in the alpine views along the way to the top of Vršič pass. Passing on just one of these opportunities seems like a waste, as every view is different, every mountain face special. There is a particular spot, near the seventeenth serpentine, where people have stacked small stones one on top of the other, over and over again, creating what seems like a crowd of small, ivory men. This eerie congregation seems to perpetually gaze at the misty mountains in the distance, inviting you to join them in silent contemplation. And standing with them is quite an extraordinary experience, as you feel like a giant, in comparison to the stacks of stone, and yet so very small in the face of the gargantuan mountains on the horizon. Another spot well worth a stop is near the Giant Maiden, or Ajdovska deklica in Slovene, a rock formation that resembles a woman’s face. 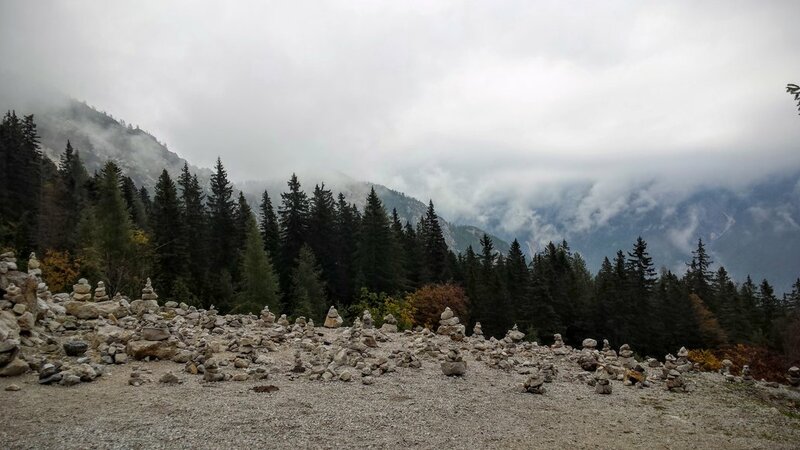 According to legend, the woman in the stone wall was a giant, and her story is wonderfully interconnected with the story of Goldenhorn the ibex, adding more magic, mystery and wonder to the myth we had heard back at Lake Jasna. It was after visiting the Giant Maiden that we finally arrived at the top of Vršič Pass. Even though it had been a fairly warm summer day, with some clouds strewn here and there, the temperature at 1.611 metres of altitude was quite low and the cold wind made it impossible to stand outside for a longer time. However, the bragging rights of having your picture taken with the sign sporting the elevation, as well as the breath-taking views of the mountains are both worth a little endurance. The ride down from Vršič is just as windy and thrilling as the ride up, albeit with less cobbles and with the views winding down. This does not mean that the wonders cease, however, as the way down leads into the Trenta Valley and the source of the Soča river. The Trenta Valley is a beautiful valley in the Julian Alps, surrounded by mountainous giants, spotted by small houses everywhere and lush with such an amazing green that is it hard to take it all in at once. And it is made so much more wonderful by the Soča river winding its way through it. Tagged daytrip, Gorenjska region, gorge, history, lake, Posočje region, river, Triglav National park. Bookmark the permalink.